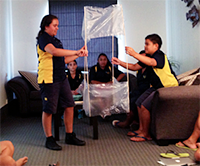 Mangere Central students discuss their Science experiment about kites. Southern Cross Campus students Harold (student council member) and Sione with their teacher Clint Samaseia, junior/senior social studies and Spanish teacher, who is also a Virtual Professional Learning Development (VPLD) mentor. Harold taught a kaparima (Cook Island action song) while Sione taught a lakalaka (Tonga’s national dance) as part of their additional sharing with whānau Māori. The CORE Pasifika Team had the wonderful opportunity to share their “Pasifika hearts” and open up those of our Māori whānau with a two-day hui/fono in Tāmakimakaurau last month. It was an opportunity for the Pasifika Team to share with their tuakana — whānau Māori — some important insights into how Pasifika cultures have fared in Aotearoa. Pasifika stories were shared by experts in their field — David Faavae discussed his findings about his research on Tongan boys’ underachievement, Christine Nurminem, CEO of the Pasifika Education Centre highlighted the status of Pasifika languages as a premium, and Dr. Melani Anae navigated a journey into Aotearoa’s not-too-distant past with the Dawn Raids and the rise of the Polynesian Panthers in the 1970s. Children from local schools also paid us a visit to share their learning experiences as Pasifika learners in Mangere Central and Southern Cross Campus. CORE Whānau & Pasifika from manu faaea-semeatu on Vimeo. Months of planning converged into two days for Polyfest professional learning with the wider CORE staff. 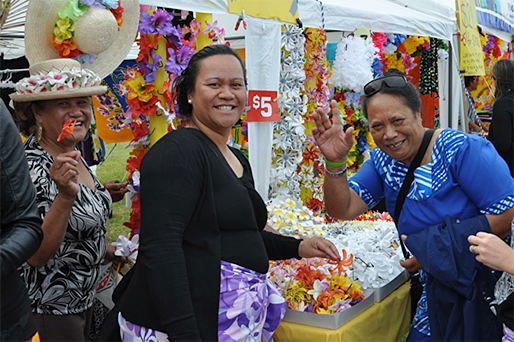 The biggest secondary schools event in the southern hemisphere would play host to a small group of excited adventurers from CORE, eager to absorb Pasifika cultures through the sights, sounds, and food, at the ASB Polyfest. But, before the Pasifika Amazing Race activity could kick off at ASB Polyfest on Friday 14 March, the scene was set a day earlier with CORE staff divided into four teams, with the team names selected from four of the Pasifika values in different Pasifika languages, held in the Pasifika Success Compass of the Pasifika Education Plan 2013-2017: Vaerua (spirituality in Cook Islands Māori), Tautua (service in Samoan), Kaumai (belonging in Tongan) and Feoaki (reciprocal relationships in Niuean). The team members were decked out in brightly coloured ie lavalava, a uniform that matched each of the four Pasifika values from the Pasifika Education Plan 2013-2017. #COREPolyfest from manu faaea-semeatu on Vimeo. 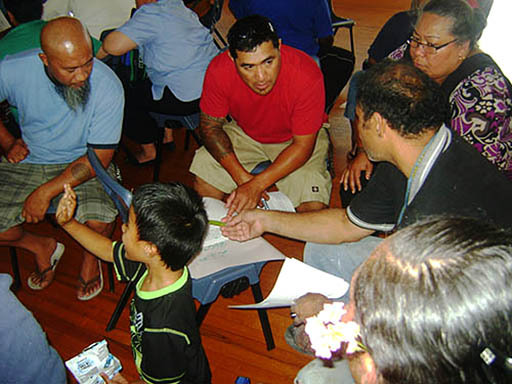 What efforts could you make to enable to become more culturally responsive to Pasifika peoples? How would this impact on your daily life? Will it make a difference to the future of education in Aotearoa? 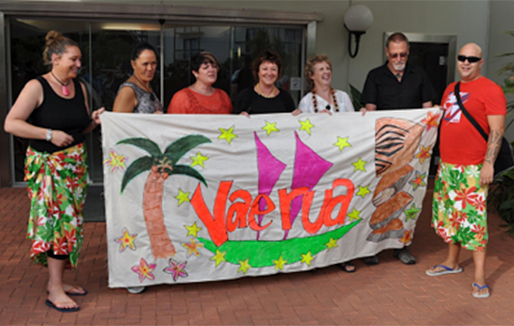 The benefits for CORE staff in these culturally specific events have assisted all involved to be more aware of our Pasifika culture, and indeed, each other’s culture; they created awareness of the need for cultural sensitivity; and created good will. If we reflect on the Pasifika journeys of the CORE aiga, who have experienced these events, what could such an approach by other communities in the education sector do? Manu Faaea-Semeatu recently visited the Parauka Marae with the Pasifika Team as part of the CORE Maori Hui, with kaihautu Wharehoka Wano and Deanne Thomas. Here are her reflections at the end of her visit. You wouldn't normally see those two words together in a headline, because Pasifika people were not part of the historical events that took place in Parihaka's story. Sitting in the wharenui, in Parauka Marae, I can't help but wonder how Te Whiti and Tohu would feel about having Pasifika people in their space, because they were such staunch proponents of Maori tikanga, and the prophets wouldn't have known any Pasifika people in their lifetime. Even looking up at their pictures in the wharenui, I see their eyes looking at me, asking me to think about my own people. What legacy will Pasifika people leave in Aotearoa? I can feel the mana and the wairua of the place. In my mind's eye as Wharehoka Wano took us through the whenua and showed us the landmarks of his home, I saw children playing games, young warriors with their feathers in their hair, women gathering food and singing waiata. I can also hear marching, a cannon being dragged and pushed to the top of a hill. I studied New Zealand History in 7th form History at high school. I remember one trip we took was to Meremere, to visit pa sites, and even a colonial museum, to see what settler life was like in early New Zealand. Nothing would prepare me for the spirit of Parihaka. It reminds me of Samoa, of my own villages where family live in a communal space, make decisions together—and even have the same divisions when conflict, both external and internal, become apparent. Today we are leaving Parihaka. I wanted to retrace the steps that Wharehoka took us through yesterday, so I woke up early to revisit where he lead us. I stood again at Te Whiti's memorial, and I could hear chanting in the distance, morning karakia in whispered tones carried up to me on the wind. In an instant, the wind started howling, but I felt enveloped in warmth. Suddenly, I remembered what Wharehoka had mentioned yesterday, he talked about tororanui—like the wingspan of an albatross, the people of Parihaka, of many iwi from the North were enveloped by the warmth of Te Whiti and Tohu. Pasifika in Parihaka, we now understand why there are so many beautiful waiata and stories about this place, being here is a once-in-a-lifetime opportunity.